I have been reflecting a lot recently on the relationship between the environmental movement and social justice. So when I learned that my friend Archana was going to be attending the BreakFree Northeast Action in Albany, NY, I asked her to write her reflections about the experience. In Albany, NY, trains holding unstable fracked oil run close to local communities, polluting the air and endangering the health and safety of people. The action was organized by 350.org to demonstrate the need to keep fossil fuels in the ground for a more just, sustainable future. I didn’t expect it when I first asked, but her story clearly represents a powerful example of how environmental and social activists fight for justice separately instead of together. Below is the piece written by Archana, an alumni member of Divest Dartmouth and a leader of the Dartmouth Alumni for Climate Action, who participated in the action in Albany on May 14. One of the organizers of the Break Free Northeast mass action shared this song with us before our march to the port of Albany. Like old friends, we sang it in harmony in the halls of a church the night before the action, and the morning of, gathered in our thousands in Lincoln Park. A beautiful sentiment: keeping fossil fuels in the ground will bring a worry-free future. Immediately after this song, a woman took the stage on behalf of the Black Lives Matter movement. As lovely as that sentiment is, she said, and however much better our lives will be, all of our troubles will certainly not be over once the oil and gas are left in the ground. Racism will still exist, she said. I was so glad to hear this in Albany, time and again. The issue that the mass action centered around was a social justice one at its core, inextricable from race and class. The oil trains that snake through the city run close to residential areas, and sometimes park nearby overnight. These residences, like Ezra Prentice, are home to largely black and low-income communities. Children sleep mere meters from these parked trains at night, whose cars have shells that have buckled under the weight of the oil they carry in past derailments. The fumes waft over from the vents in the cars, through their open windows on summer nights. The people in these communities have been battling the Albany authorities and the oil companies behind these trains for many years now, but to little effect. It is a textbook case in environmental racism and classism. The lives of the folks living in Ezra Prentice and surrounding communities clearly appear to matter less, their voices drowned out by the shrill ring of the cash machine. And yet – while the Albany Break Free action did a wonderful job choosing speakers and programming to tie the racist and classist implications of the “bomb trains” to the larger environmental movement, there were clear hints of tension between the two. The sea of yellow Break Free T-shirts read “Break Free from Fossil Fuels,” and the chants of the marchers covered everything from energy (‘Hey hey, ho ho, fossil fuels have go to go’) to democracy (show me what democracy looks like? This is what democracy looks like!). But there was not one Black Lives Matter chant. The crowds of protestors were largely white, adding to this contrast. The image of the movement that day, the pictures and articles that would appear in the papers and other media, did not reflect the full extent of the messages I had heard. 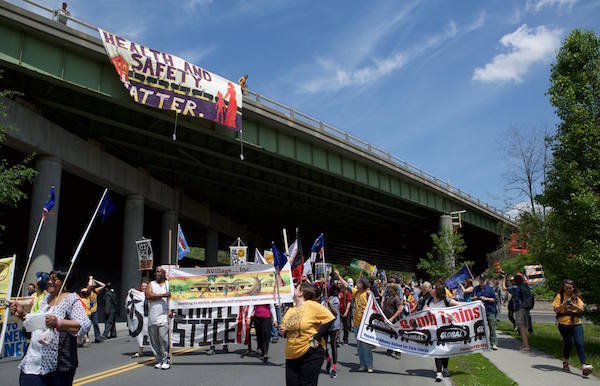 Even though the Albany organizers took great strides to bring the climate justice and social justice worlds together, the disconnect between the larger Break Free movement and the everyday problems of the local community remained visible. This seemed to be the climate change movement showing up for social justice, rather than the two walking hand-in-hand. As a student from Dartmouth pointed out to me, it is better to walk the walk than talk the talk; at least the intention and the messages hit the target, even if the image did not reflect this. Another friend of mine emphasized the importance of a focused message, and debated whether this would be diluted if we tried to bring both the fossil fuels and Black Lives Matter movements together. In my mind, it is imperative to link the two, and to do it better than we have been doing. We cannot use our frontline communities as a pawn in breaking free from fossil fuels; to do so would be an act of the highest hypocrisy. There is strength in equality and unity, and it is exactly this strength that we must harness to increase the power of our actions to come.